Imagine the internet that would offer you to communicate privately with anyone else without censorship, safe from the prying eyes of surveillance authorities…. … Decentralized, Encrypted, Peer-to-Peer Supported and especially a non-IP Address based Internet. Yeah, a New Private Internet that would be harder to get Hacked. This Internet is a dream of all Internet users today and, of course, Kim Dotcom – the Famous Internet entrepreneur who introduced legendary Megaupload and MEGA file sharing services to the World. Kim Dotcom announced plans to start his very own private internet at the beginning of this year and has now revealed more details about MegaNet — a decentralized, non-IP based network that would share data via "Blockchains," the technology behind Bitcoins. On Thursday, Dotcom remotely addressed a conference in Sydney, Australia, where he explained how MegaNet will utilize the power of mobile phones and laptops to operate. MegaNet will work on non-IP-based Internet that will use blockchains and new protocols to communicate and exchange data while using the Internet's existing physical infrastructure. MegaNet will actually rely on the unused processing power of people's smartphones and laptops. Users with MegaNet on their smartphone would be able to donate their device's processing capability and storage bandwidth when they actually aren't using it. Dotcom believes that once the service has enough subscribers, this would become an incredibly large amount of power, so much so that it can operate MegaNet. "If you have a 100 Million smartphones that have the MegaNet app installed we'll have more online storage capacity, calculating power and bandwidth than the top 10 largest websites in the world combined [together], and that is the power of MegaNet," Dotcom said. "Over the years with these new devices and capacity especially mobile bandwidth capacity, there will be no limitations." 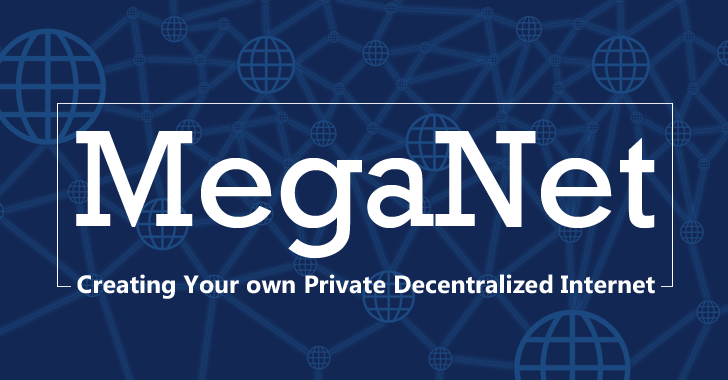 So in short, MegaNet is a decentralized Internet, as Dotcom says, "from the people, for the people." MegaNet will still use using the Internet's existing physical infrastructure people use today, but will add an extra layer of encryption running through all communications. Dotcom did not reveal too much detail about the encryption he will be going to utilize, but said that he is going to harness very long keys, systems that won't be "reverse engineered or cracked by any supercomputer." Most importantly, MegaNet will make it difficult for law enforcement agencies to invade its users privacy, as the entire network is fully encrypted. "If you don't have IP addresses you can not hack the server, you can not execute denial of service [DDoS] attacks on gaming services or websites," Dotcom said from New Zealand, where he's currently awaiting the result of his extradition trial. The millionaire is confident that MegaNet would be an excellent technology solution that will keep you secure over the Internet, without the requirement of any new infrastructure for users’ privacy. With the launch of MegaNet, which is expected sometime in 2016, Dotcom hopes 100 Million users to sign-up within the first year of its launch.